ChiQua, also known as. 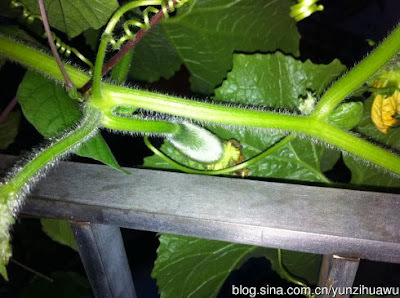 Hairy melon, fuzzy gourd, Chinese preserving melon, wax gourd, moa qua(”hairy gourd”). This little green was growing in one of my pots, and I believe it brought by birds. I thought I just try for some fun, all my need is a big container, potting soil, and a spot that gets six hours of sun. 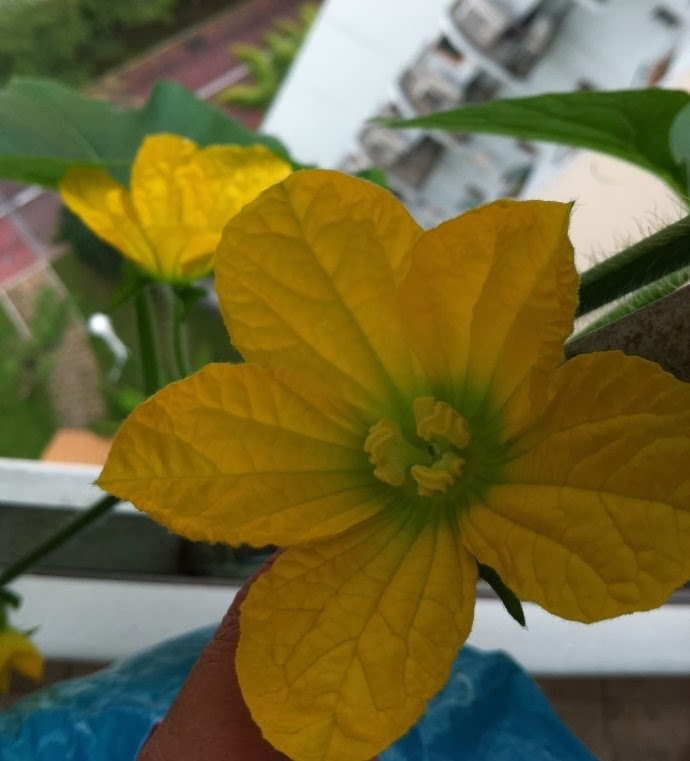 So I placed the big pot near the lift, and I started to enjoy seeing the little plant growing bigger and bigger every day...At first I though it was pumpkin but soon I know it is not pumpkin, It looks like zucchini. I made sure the plant was well watered. Normal, I watered in the evening after I came home from work and was careful not to get water on the leaves or flowers, as I noticed the flowers drop easily and the leaves turn yellow if water drop on them. When my first flower buds started to form, I really cant tell what the plant is. 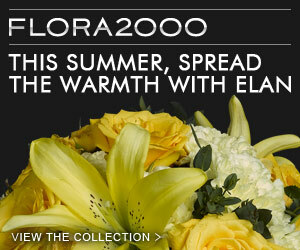 But I did notice the difference between male and female flowers, The female flowers didn’t have “thicker stems”. They had teeny tiny fruit as their stems! The male flowers are bigger with long and slender stems, and I started to do some hand-pollination for them. I used cotton buds to transfer pollen from the male flower to the stigma of the female flower to ensure successful production. It was quite easy and only took a few minutes but really it was fun. I feel like I am doing a great job to make a new life start.